It is now 9:17 AM PT Time on Wednesday, April 24, 2019. Positive check-ins and scratches may be processed NOW on SwimPhone. Thank you for helping us reduce empty lanes and run an efficient meet. SwimPhone is a free website that you can use on your own computer or phone or tablet. No worries! Online meet registration is open right now on meet day. 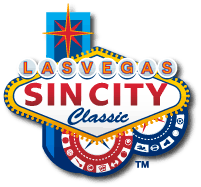 Las Vegas Masters is proud to host our annual swim meet in partnership with Sin City Classic Multi-Sport Event! Enter the facility NO EARLIER THAN 2pm. Our Masters meet will follow a collegiate meet and the college coaches kindly ask that we enter the building after they have completed their meet. Please click here to begin volunteer signup. We need timers and other key jobs filled. 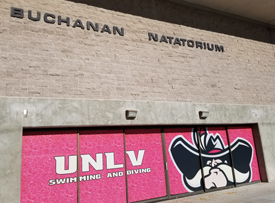 UNLV Buchanan Natatorium, Jim Reitz Pool. Indoor 50-meter by 25-yard pool. This meet is short course yards. Expert measurements will be taken before and after the meet for potential SCY record-setting swims! There is no postal address; do not use the university’s generic Maryland Pkwy address. Location is on E. Harmon Ave, 1000 feet east of the intersection of Harmon Ave and Swenson St, Las Vegas, NV. Very close to McCarran airport, Hard Rock Hotel & Casino, Hofbrauhaus, and Hyatt Place. The length of the competition course is in compliance and on file with USMS in accordance with articles 105.1.7 and 107.2.1 but as a bulkhead course, is subject to length confirmation. Eligibility of times for USMS Top 10 and records will be contingent on verification of bulkhead placement. AIR TEMPERATURE: This facility maintains a cool air temp; warm clothing, boots, and parkas are advised, maybe an extra towel too! Good news is the showers are terrific! From 15 North, take 215 East toward McCarran Airport. Continue onto McCarran Airport Bypass. Continue onto Swenson St (the airport bypass becomes Swenson St). Turn right onto E. Harmon Ave. Continue 1000 feet to Parking Lot L on your left. Parking Lot L is available for free to non-students on weekends, so go ahead and park in a spot marked "Student" . Walk north on asphalt path toward Buchanan Natatorium entrance on right (tennis courts on your left). See UNLV Buchanan Natatorium at top right of this map (red pin), which is the northeast. Do not use the university’s generic Maryland Pkwy address! Location is on E. Harmon Ave, 1000 feet east of the intersection of Harmon Ave and Swenson St, Las Vegas, NV. Swimmers must be USMS members registered for 2019. United States Masters Swimming rules will govern. Current SPMS meet procedures will be enforced and take precedence over any errors or omissions on this form. The meet referee will be in charge of the meet. Any questions regarding the conduct of the meet should be directed to meet referee. All events are timed final. Swimmers are limited to a total of 5 individual events. Age on January 19, 2019 determines age group for the meet. You must be at least 18 to compete. The pre-entry postmark deadline is Jan 16, 2019. Online entries will close Wednesday, January 16, 2019 at 11:59pm. Meet-Day Entry is available online from any web-enabled device (you can enter on meet day from your own phone or computer). Meet-Day Entry is permitted until 3:15pm for events 1-6 and 4pm for events 7-18. We encourage deck entry processing “paperless and cashless” on your own device or on a computer at the pool. Bring your credit card, cash, or check. The 500 Free will close at 32 entries (4 heats). The 400 IM and 200s of Back, Breast, and Fly will accept deck entries only, not pre-entry. Please request entry into these events at the admin desk by 4pm on meet day. $35 per swimmer flat fee. Las Vegas Masters members see a $0 meet fee because the meet fee is included with annual dues. LVM members shall renew their membership and pay member dues for 2019 prior to processing this meet entry. Any satellite LVM member shall pay the $35 meet fee as a donation. Swimmers will be seeded in heats according to entry time, regardless of age and gender. Heats will be ordered slowest to fastest. Positive check-in is required for the 500 Free and encouraged for all events. Check-in will be available on SwimPhone.com beginning at 8pm on January 18. Positive Check-In for the 500 Free closes at 3:15pm. There are no relays in this meet. Poker cards with your results stickers may be collected for competition with other swimmers to see who has the best poker hand. The best two poker hands win big prizes! Some other surprise gifts too! Las Vegas Masters will provide free water and snacks (ie fig bars, fruit, cheese sticks). We are planning a delicious BBQ on the patio with hot chili! It is free to all swimmers and meet volunteers. Approximate time of BBQ is 6:30pm. Online Registration closed on 1/19/2019.